Improvements in efficiency of boiler and steam systems can result in significant operating cost savings. Audits have indicated that 15 – 20% fuel savings can be achieved with a payback period of less than 2 years. In addition, total annual emissions of air pollutants, such as NOx and CO2 are also reduced. 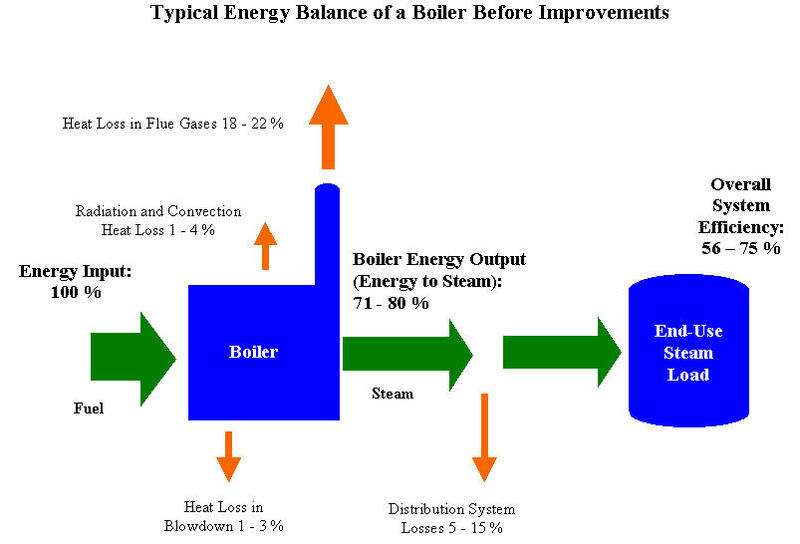 The figure below illustrates typical losses in a boiler/ steam system. Note: the above savings exclude electricity, water and chemicals. “Boilers and Heaters – Improving Energy Efficiency”; Natural Resources Canada – Office of Energy Efficiency; 2001.This 18 page primer is an excellent introduction to boiler efficiency and methods for determining efficiency. Topics include fundamentals of combustion and heat losses; boiler and heater operational controls; environmental impacts of combustion; combustion regulations; energy management tips. U.S. Department of Energy, Office of Industrial Technologies, Steam Best PracticesThe “BestPractices” program helps to identify opportunities to save substantial amounts of energy in industrial manufacturing plants. It provides access to Informational resources and tools, technical assistance and demonstration of emerging technologies. BestPractices teams with industrial companies to conduct hands-on energy assessments and training in energy management practices.The website also provides downloads of the following software:Steam System Scoping Tool. This spreadsheet is designed to help steam system energy managers and operations personnel for large industrial plants. The program will profile and grade steam system operations and management. This tool will help you to evaluate your steam system operations against identified best practices.Steam System Assessment Tool. This allows users to assess potential savings from individualized steam-system improvements. Users input data about their plant’s conditions, and the software generates results detailing the energy, cost, and emissions savings that various improvements could achieve. “Council of Industrial Boiler Owners Energy Efficiency Handbook”; 1997.This 63 page handbook provides information on water treatment; combustion; boilers; controls; heat recovery; fans, pumps and other auxiliaries; flue gas treatment; steam systems; compressed air systems; and electrical distribution systems. Alliance to Save Energy website: www.ase.org/steamingahead/. The website provides case studies, tip sheets and links. Natural Resources Canada – Office of Energy Efficiency website:www.oee.nrcan.gc.ca.